On her Goop website, Gwyneth Paltrow claimed that charcoal lemonade was one of the “best juice cleansers”. That was in 2014. Today, charcoal products – from croissants to capsules – are everywhere. Even high street coffee chains have taken to selling charcoal “shots”. 1. Activated charcoal will bind with all kinds of things including some of the vitamins, minerals and antioxidants in your food. Charcoal is sometimes added to fruit or vegetable juice and sold as a “shot”. Unfortunately, the vitamins in the fruit and veg probably won’t be absorbed because of the charcoal. You’d be better off just having the juice. 2. 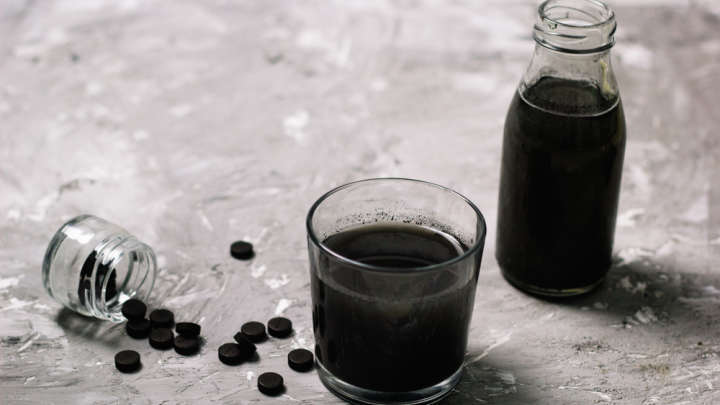 Activated charcoal can bind with some medications, including some antidepressants and anti-inflammatory medications, causing them to be less effective. This could have serious health consequences for some people, but it’s not explained on bottles or packaging where activated charcoal is being sold. 3. Activated charcoal will only bind with whatever particles are in your stomach or intestines at the time that you take it. It works by coming into physical contact with your intestinal contents. If you’re trying to use it to detox from the alcohol and kebab you had the night before, it won’t do anything at all because they have been absorbed into your bloodstream already. 4. Activated charcoal slows down your bowel and is known to cause nausea and constipation (and black stools). There are great treatments for wind and bloating that are really effective, such as reducing the fermentable carbohydrates in your diet (the low FODMAP diet) and the use of certain probiotics for irritable bowel syndrome.